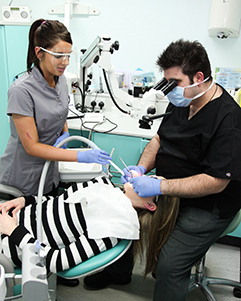 Roland carries out all aspects of dental care for his patients but also provides a referral service for root canal therapy for colleagues in South Yorkshire & Lincolnshire. He has been accepting referrals for the past 15 years and has worked in Jersey, Channel Islands providing an endodontic referral service. 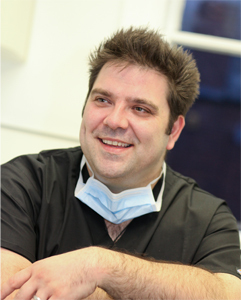 Recently Roland joined the team at SimplyEndo Clinical in Altrincham where he also accepts endodontic referrals. Roland initially qualified as a Dental Technician in 1992 from Manchester Metropolitan University where he won several awards. After working as a Crown and Bridge Technician, Roland went onto study Dentistry at Sheffield University being awarded the British Dental Association L S Farrar Scholarship Award in 1996. He qualified as a dentist in 1998 and went on to work as a Senior House Officer in Oral and Maxillofacial Surgery. After passing the MFDS RCS diploma from The Royal College of Surgeons of England in 2002 he went into general dental practice. In 2009 he became a partner at Woodseats Dental Care. Roland has completed a Post-Graduate Diploma in Endodontology at the University of Chester and is currently working towards an Masters degree in Endodontology. In 2014 Roland became a full member of the Faculty of General Dental Practitioners, Royal College of Surgeons of England (MFGDP). Roland has also completed a PhD in Forensic Dentistry at the University of Sheffield and has been undertaking forensic casework as well as lecturing both in the UK and internationally, he has also published papers on the subject and written a book chapter on bite mark analysis in Forensic Odontology: An Essential Guide published in 2014. Roland was “Highly Commended” in the Dentist of the Year category at The Probe awards 2011. Roland is a member of the European Society for Aesthetic Orthodontics and has undergone training using various Clear Aligner orthodontic appliances as well as the Inman Aligner system. GDC Registration 74723 Registered Dental Surgeon & Dental Technician.